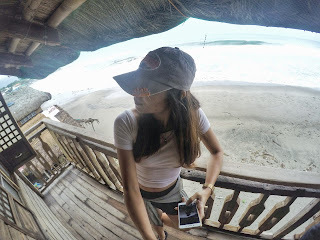 Monaliza Surf Resort is only just one of the resorts one can check into should someone pay a visit in one of the most famous surfing capital of the Philippines - San Juan, La Union. 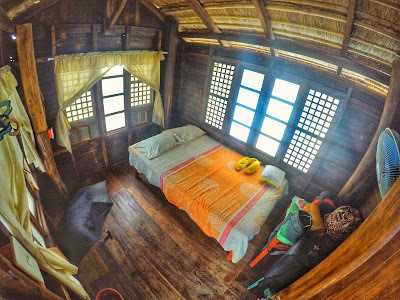 They have varieties of room and accommodation to offer but what I loved about it are rooms in the nipa hut. Actually there are only two of it. 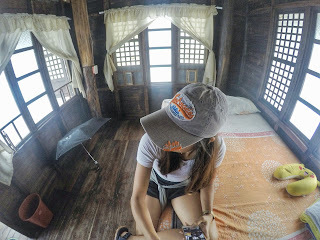 They are these old-fashioned rooms with wooden walls and floors, with capiz on its windows and nipa for its roof. Don't underestimate these materials, though; as I've proven them sturdy because I was there when it stood still against the strong winds, heavy rains and big waves brought by Typhoon Goryo and its habagat recently. Anyway, There's a bed good for two, a fan, table and stools and a mirror in it. Nothing more. Nothing less. It's quite simple but I find it extravagant and homely and I'll tell you why. There are numbers of resorts that one can choose from in Urbiztondo but what makes Monaliza Surf Resort stand out that will make you check in to it? 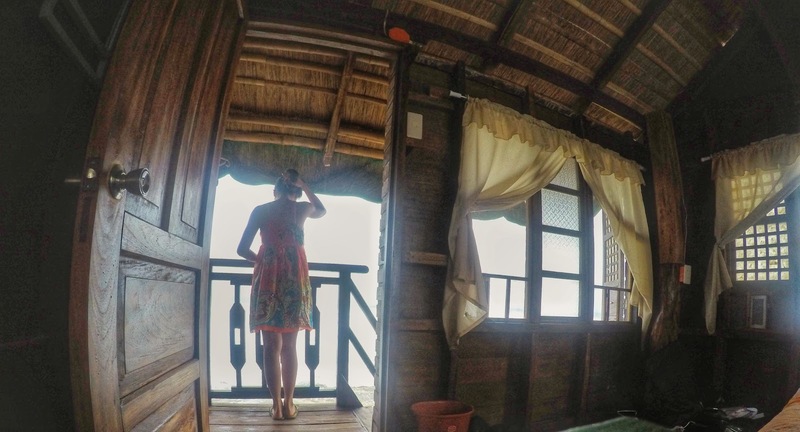 Tourists usually pay convenience and comfort a lot of consideration when choosing a resort or inn for accommodation. Presently, people look for rooms with air-condition, warm showers, television and Wi-Fi and consider it as standards for relaxation. For the record, Monaliza Surf Resort don't have most of it. But what makes it still the best pick? 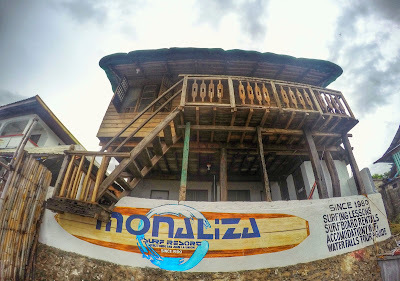 First, Monaliza Surf Resort has long been established since 1980 and this has a lot to offer other than rooms with televisions, air condition and warm showers. No televisions. there is no need for television when you are in the place. Why lock yourself in a room watching television for some virtual reality when you have a window and a balcony with a 270 degrees of the sea-sky divided horizon, view of the vast West Philippine Sea, sick-awesome waves ridden by surfers? Why go virtual if you are totally in the paradise in reality? What's a day or two of missing your favorite TV show? It's something that you have been doing at home and it doesn't hurt to miss it. In fact, you have internet and friends who could always tell you about it when you get home. Weak Wi-Fi. 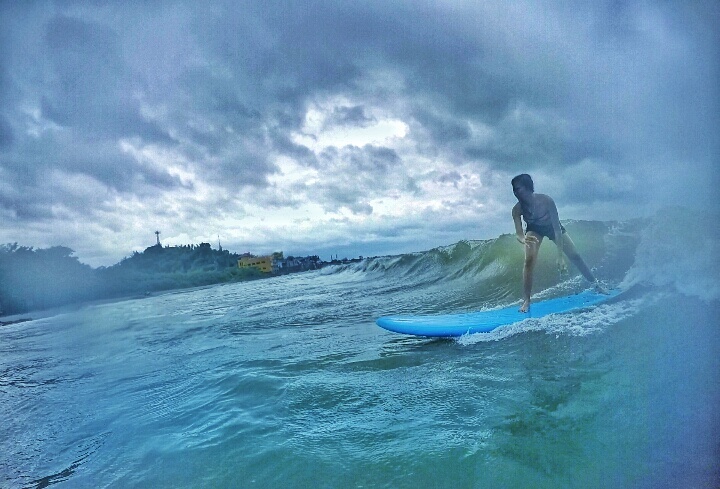 Why surf on the internet if you've got real waves in just a few steps from your room to surf on? LIVE. IN. THE. MOMENT. Again, you can always get back into this at home. Don't know how to surf? This is nothing to worry about. Monaliza Surf Resort offers surfing activity with instructor who will teach you the basic and how-to's of it for only 400php in an hour. Believe me, their instructors are good enough you'll learn how to surf in an hour. But if you know how to surf already, They offer long and body surf boards for rent for only 200php/ hour and 800 for the whole day of use. Going back to the Wi-Fi matter, if you're going there with a friend, a lover or a gang, why would you resort to a Wi-Fi party? Go keep those gadgets and busy yourself with something else. Bring a deck of uno cards or any playing cards. Play those silly games. Go out and hop from a restaurant to another for a food trip. Create new moments with them! Wander somewhere were the Wi-Fi is weak because you'll find something better in it. "Surf not on the internet but on the ocean waves"
No warm showers. Scientific studies have proven that cold showers do good in our body. Plus, it's not a week or a month that you'll be staying in there and have a cold shower everyday. Once you're done with the shower, warm yourself up with some hoodie wrap up and a cup of hot coffee, tea or chocolate. Monaliza Surf Resort is just a few steps away from El Union Coffee and they serve best hot beverages! Go sweat a bit by walking a few meters and grab that cuppa! Where's the best spot to consume that hot beverage? Of course, at the balcony with some sea breeze against your skin. With the cold sea breeze at night, you won't be needing aircondition. Just leave your windows open and you'll definitely be wrapping yourself up with blankets at dawn because the wind is really chilling. See? Why look for those stuff if the place itself will be providing you with a better alternative for it. 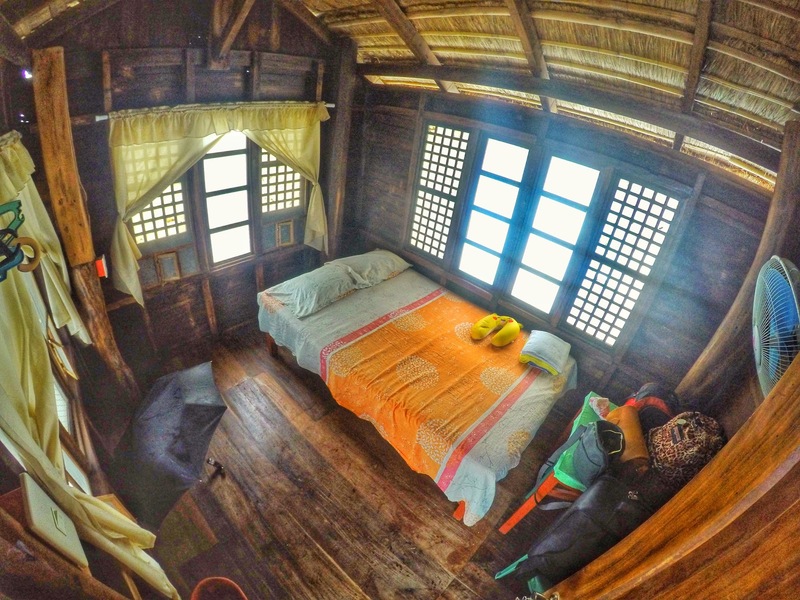 This is what Monaliza Surf Resort offers. They are there to bring out the best of the place for you to enjoy without conforming on those 'standards'. Hi, pet friendly po ba yung place?